I was so glad when we got to November, we're taking it easy this month! I have planned very little school for this month, but we are keeping up a bit of the routine just so that things don't fall to chaos around here! We're still doing our morning chores and circle time. 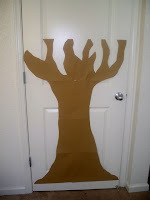 Today I put up our "Thanksgiving tree" that will be part of circle time. I have foam leaves that will stick on there, and we each write something we are thankful for on one of them everyday. By the time we get to Thanksgiving our tree should be full of leaves! I announced at breakfast yesterday that we would not be doing as much school this month, but we would be doing quite a bit of P.E.- this was greeted with blank stares- physical education- more blank stares- "you'll be spending quite a bit of time playing outside and riding your bikes"- cheers arose around the table! The weather is great around here and the kids love getting out to run, play, ride bikes/scooters etc. They can do all of this while I sit on the porch and rest, or we can all go for a nice long walk if I'm up to it (that is what we did today). We're staying away from the playgrounds for now though to avoid catching a bug. some fall/thanksgiving things for the kids. Its not much, but they are quite happy with it. We don't have many Thanksgiving books, but tomorrow we will be picking up a bunch that I have requested from the book mobile. The kids like handling the corn and the gourds, something I remember my mom leaving out for us to play with too (I'm thinking it was Auntie B that encouraged her to do this!). Since we also have a bunch of Christmas toys the kids will not see their regular toys for two months. This will be nice when we are trying to get back to "normal" after Miss C's birth and the holidays.